overloading the system with oxygen and depleting the carbon dioxide needed for balance. Air enters the nasal chambers and the mouth, then passes through the pharynx, larynx, and bronchi into the bronchioles, which form a network around the alveolar air sacs in the lungs (figs. 3-34 and 3-35). Air enters the NASAL CAVITY through the nostrils (NARES). Lining the nasal passages are hairs, which together with the mucous membrane, entrap and filter out dust and other minute particles that could irritate the lungs. Incoming air is warmed and moistened in the chambers of the nasal cavity to prevent damage to the lungs. The mouth and nose serve as auxiliary respiratory structures. The EPIGLOTTIS is a lidlike, cartilaginous structure that covers the entrance to the larynx and separates it from the pharynx. It acts as a trap door to deflect food particles and liquids from the entrance to the larynx and trachea. The LARYNX, or voice box, is a triangular cartilaginous structure located between the tongue and the trachea. It is protected anteriorly by the thyroid cartilage (Adams apple), which is usually larger and more prominent in men than in women. During the act of swallowing, it is pulled upward and forward toward the base of the tongue. The larynx is responsible for the production of voice. This is accomplished by the passing of air over the vocal cords. The ensuing vibrations can be controlled to produce the sounds of speech or singing. The nose, mouth, throat, bone sinuses, and chest serve as resonating chambers to further refine and individualize the voice. The TRACHEA, or windpipe, begins at the lower end of the larynx and terminates by dividing into the right and left bronchi. It is a long tube composed of 16 to 20 C-shaped cartilaginous rings, embedded in a fibrous membrane, that support its walls, preventing their collapse (fig. 3-35). The trachea has a ciliated mucous membrane lining that entraps dust and foreign material. It also propels secretions and exudates from the lungs to the pharynx, where they can be expectorated. 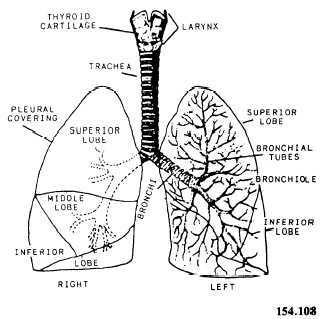 The BRONCHI are the terminal branches of the trachea, which carry air to each lung and further divide into the bronchioles (fig. 3-35). The BRONCHIOLES are much smaller than the bronchi and lack supporting rings of cartilage. 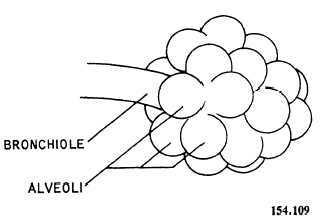 They terminate at the alveoli (fig. 3-36).